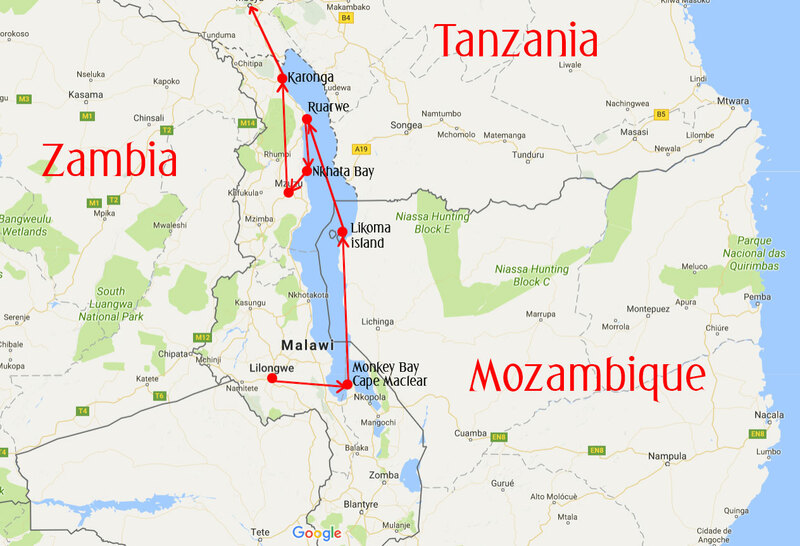 I decided to take a plane to Malawi from Mozambique because I was told there “might be trouble near the border” and not to risk it. and so I encountered my first hurdle in my “smooth transition constantly moving forwards”: No direct flights to Lilongwe from Maputo. I had to go back to Johannesburg. Are you kidding me? It felt incredibly wasted for me to take a step back to go forward and for a split second I was thoroughly annoyed. Then I remembered: This trip embodies total freedom for me. It’s not like I have to be in Lilongwe at a certain time for something. Just freakin’ relax and get on the plane. So I did. And now I’m glad I did because I once I touched down in Johannesburg I had to retrace my steps from my first visit. 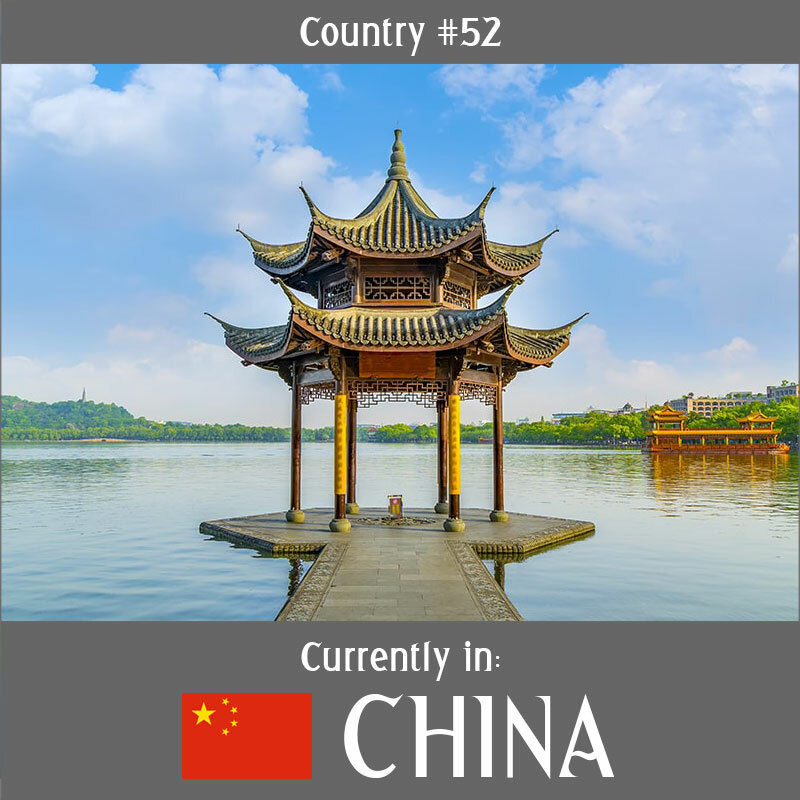 I went through the same checkpoints, hallways and shop areas as when I was heading for Zimbabwe in February. Upon landing in Malawi everything was pretty straightforward (for Africa). I got in line, filled out the form, paid the most expensive visa fee on my trip so far ($75 for single entry!) and met my driver outside arrivals. He held up a sign calling for “Anne and she’ll” and for a second I thought they’d be two of us going to the hostel, but I guess he’d just copied a bit more of the e-mail than intended on the sign because after I had gotten some money out of the ATM we left and drove towards Lilongwe. Get off the table, dog? No? 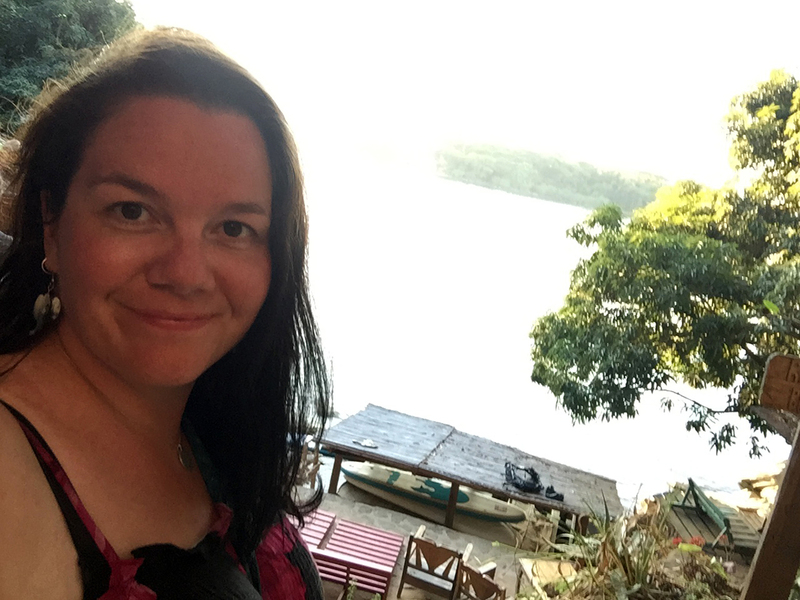 I decided I had time to see everything and my #FoMo (“Fear of Missing Out”) kicked in, as it always does, so I started planning my trip to Cape Maclear via Monkey Bay. Apparently nowadays in Malawi you can get on a minibus destined to go somewhere, but if there aren’t enough people going to the end destination they will cut their losses and just dump you somewhere along the road. Which I guess is fine for the locals, but I was not very comforted by this, particularly since AXA, the major bus company has dropped their route going from Lilongwe to Monkey Bay, meaning I would have to get on at least three different buses to get to Monkey Bay alone. Fortunately, Sophie, helped me out. She found a guy who consented to drive me to Monkey Bay directly. Vastly more expensive than a minibus, but all in all the 3,5 hour trip cost me around $60 – which I was glad to pay. I got to Monkey Bay safely, stayed there one night and the next morning made my way to Cape Maclear. There are so many people going between Monkey Bay and Cape Maclear it’s no problem getting a taxi or motorbike taxi there… Of course, you have to go through the “police checkpoint” which is basically two-three cops standing at a tight bottleneck of the road getting paid bribes to let people through… The minute the policeman saw me he pointed at me and “needed to see the driver”. He then proceeded to “inspect the car” and lo and behold the driver needed to pay him to go through. I have no idea if the driver was carrying something in the trunk and the policeman looked the other way or if it was because he was transporting a white tourist, but the driver actually had to get 2000 kwacha in advance from me because he didn’t have cash. he then walked over to the police officer and “shook his hand” leaving the 2000 kwacha in the cops palm in the most subtle mafia-movie-exchange of money I have ever seen in real life. I just thought: “Africa…” and shook my head. (And before you get riled up and defend the poor people who don’t get paid and need to make a living: I get all that. I understand -why- it happens. I just wish it didn’t have to -and- I would like to point out that even if all the people accepting bribes out of necessity stopped doing so, there would still be bribes based on greed). Malawi is one of the friendlies countries I have ever been to, but also it bears mentioning that it was the first country I was exposed to bribes committed and attempts to coax me into bribing officials. It’s something I understand, but find it hard to respect. Poetically enough this would also encompass my last experience in Malawi at the border crossing in Songwe, but I’ll tell you about that at the end. Anyway! Monkey Bay is not much to see. The ATMs don’t work, the shop has two types of biscuits, two flavour noodles, some god awful syrup to mix with water and 5 litre jugs of water and the Ilala Ferry leaves from there. Most tourists end up going through here on the way to Cape Maclear or the Ilala (or both) and my one night there was enough, so I went to the Ilala Ferry terminal to book my cabin for next week’s boat trip (the Ilala travels up and down Lake Malawi once a week leaving Monkey Bay early every Friday morning) and headed for Cape Maclear hoping for more chill, more fun and more atmosphere. I instantly bonded with Laura and Radic, two Polish people who travel and work. They were volunteering at Thumbi and I ended up chatting with them about everything from books to politics to hearing about Laura smashing her teeth through her lip while walking her dogs… Good times. AND, with the two of them being there I had someone to go on the catamaran sunset cruise with. I ended up reading three books at Thumbi, getting a bit sunburned and getting used to cold showers (that’s a lie, I’ll never get used to them, I’m a creature of comfort). I also tried in vain to be brave and try something new. I heard that someone would roast mouse for eating and thought “Hey yo! 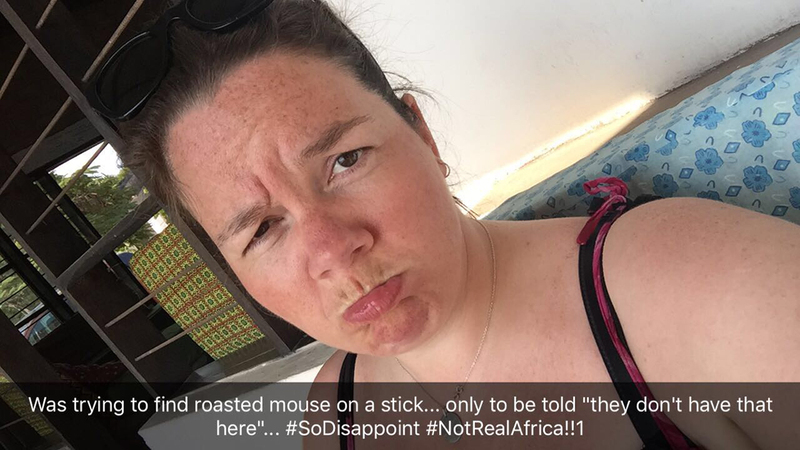 Local experience!”… But to no avail 😦 There was no mousy treat to find and when I went back and asked Noeno and Immanuel who work at Thumbi they said they knew of no one who had that in the nearby vicinity so… I was very sad indeed… Sad enough to send a snap! I was just about to go all “Molly Weasley” on this guy when the thought occured to me: it’s probably MY booking and he doesn’t realize. So I tried to explain this to him, but he started talking to the woman who had wrestled herself in beside me and proceeded to sell her a ticket instead. This happens a lot here in Africa. There is no “queue-culture” to speak of only very loosely based lines that are randomly crossed if you don’t pay attention and elbow your way in. Also, if the person you’re talking to isn’t too confident in his or her English, they may start talking to the person next to you, who is easier and more comfortable to help and this person will receive help before you unless you elbow in and protest/pick up where the guy left off… For someone like me who usually errs on the side of politeness, it can be stressful and sometimes annoying to navigate. In this case, I turned to the other ticket salesman who just sat down next to the guy squared my shoulders to prevent anyone sneaking in in front of me and said “I have booked the Owner’s Cabin, the booking is -MINE- *pointing at me* and I have to -PAY NOW- for the trip, pleasethankyou?” The guy smiled, checked his record and got his little ticket-notepad out (everything is by hand here) and jutted down my name and “Owner’s Cabin”, checked the price, said it was 47600 kwacha ($65), took my 48000 kwacha, smiled and said he “had no change” (of course). At this point I just resigned to smile rather knowingly at him and said “nevermind, which way to the ferry, please?” upon which he pointed me in the right direction and I got myself and all my crap onboard the boat. The trip to Ruarwe (where Zulunkhuni River Lodge is) would take me two days and nights and I was eager to see my cabin so the chef/saloon manager, Augustin, got the key and got me installed at once. I was not disappointed! Two beds in there that were quite comfortable a small table with mirror, a fridge that didn’t work, but who cares? I used it as a table instead and my own, private toilet and shower(!) – I have to admit, I never used the shower, but the toilet was SO nice to have. There were functioning plugs to charge my stuff, and four tiny windows to let natural light in. It was better than I anticipated and I was thoroughly happy with my choice. Of course, I found that the door didn’t lock from the inside (for some reason that’s happened to me a lot while travelling in Africa..), but I jerry-rigged a system with some hairbands and a phonecharge-wire to keep the door reasonably shut and “locked”. And, I could lock it when leaving the cabin, so my stuff was safe, I felt. (I later heard from Claire, whom I met in Nkhata Bay and whom had also been in the Owner’s Cabin just after me, that she told Augustin and he just fixed the lock the same day, but oh well, water under the bridge). I had heard from a fellow passenger that there was a massive church built on Likoma, an Anglikan cathedral dedicated to St. Peter. He said it was as big as Westminster Abbey, of course, it wasn’t, but it was very impressive none the less and it is apparently (I checked on Wikipedia) on of the largest churches in Africa. I’m gonna have to wrap this up, this post is going to be a novel… I had decided on the Ilala Ferry and Zulunkhuni before I left Norway and upon arriving (by rowboat) at Zulunkhuni I was once again not disappointed. It’s a little paradise. There’s no internet, no cellphone reception and very little electricity (solar driven lights and the possibility of charging phones and laptops only in Annelies’s cabin) and I planned to stay there from Sunday to Friday reading books, snorkelling and generally doing nothing. I was the only guest there except my first and last day, so the managers Annelies and Levi offered me a free upgrade from my dorm room to the chalet slightly higher up. 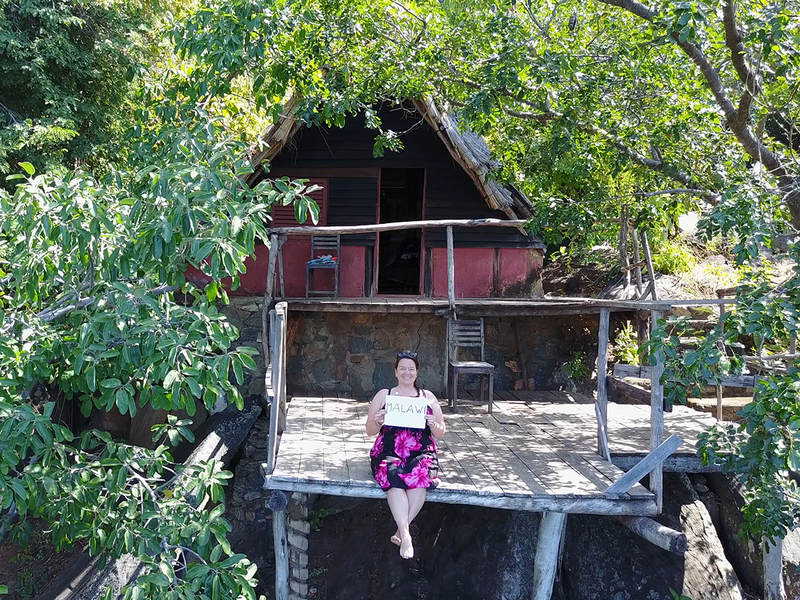 Of course, I accepted and I got my own little cabin with my very own little platform overlooking Lake Malawi. Local Project: Charging station. They charge your stuff, you pay. The chief’s grandfather… or father… or aunt… I didn’t -quite- understand that part. An old canoe used as a bookshelf. I wanted to take it home. The rest of my week there was lazy as f**k. Good times. Much read. Such dog. I met Claire at Mayoka Village and since she was going from there up to Mbeya to catch the Tazara train to Dar Es Salaam, I decided to join her. We set off towards Mzuzu with Elise, Tanya and Natasja, sharing a taxi and minibuses. 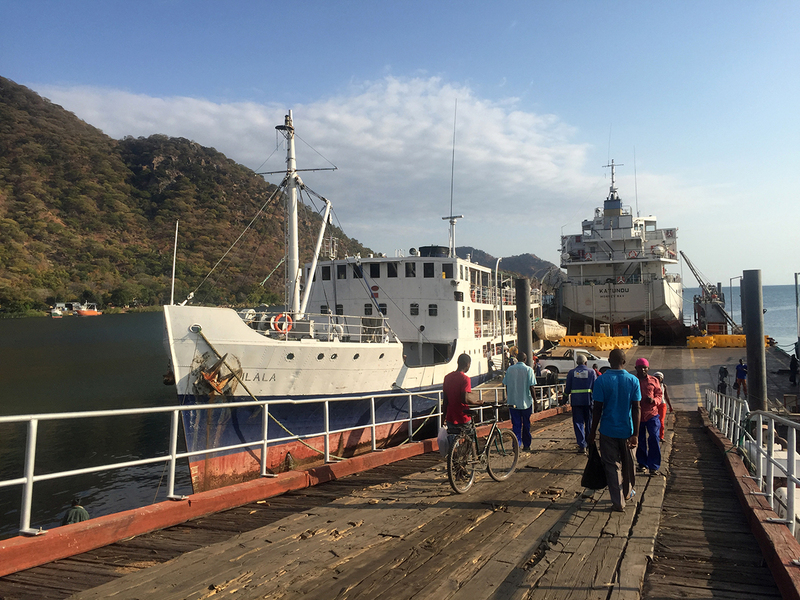 Claire and I needed to get to Karonga, our last stop in Malawi. From there we would get a taxi to the border, a minibus to Mbeya and then wed sort out the Tazara ticket. The minibus from Mzuzu to Karonga… was the first time I was actually worried in a minibus in Africa. Well done, driver, you idiot… Where the hell did you learn to dri… DID you learn to drive?? In Karonga I got Claire to come with me to see the “Malawisaurus“! Malawi has its very own dinosaur, people! And they have made a cast of the bones so you can see it in its full, bony glory in the tiny museum they have in Karonga. It was Annelies who tipped me off about it and I’m glad I got to go see it as my final goodbye to Malawi. But that’s a story for the “Tazania”-part of my blog. For now I will conclude this way too long post saying that Malawi is my favourite country so far “people-wise” (Zimbabwe doesn’t count, that whole project was a special “bubble” so it will hold a special lace in my heart no matter what). It’s known as the friendliest country in southern Africa, Africa’s heart, and I agree… The whole vibe of Malawi is warm and relaxed and I thoroughly enjoyed my time there. If I hadn’t met Claire and jumped at the chance of traversing the minibus-transport-leg-hell with someone, I would have extended my visa and stayed longer.